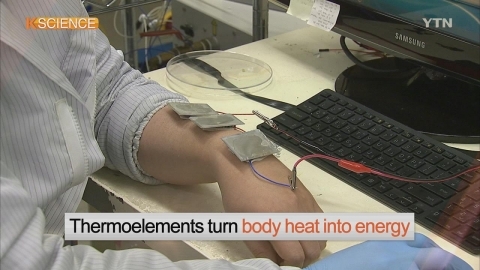 These are thermoelements to help produce electricity by using human body heat. Letters appear on the LED board when the voltage of the thermoelements attached to the wrist is increased. A team of the state-funded Electronics and Telecommunications Research Institute has developed technology to convert body heat into a form of energy to be used for wearable devices. Unlike the disposable batteries, a very small fraction of human body heat can be utilized by thermoelements to power wearable devices. The device can also be used for remote-monitoring, or remote-checking the health status of infants, young children, and elderly people. "The energy required for operating a wide range of wearable ICT devices will be supplied (through the technology) in the future." This technology is expected to be commercialized within two to three years. And it will serve as the basic technology for the wearable and Internet of Things sectors.